A space for students to share news about the wide range of social and political struggles in which they're involved. In this new biweekly collection of dispatches, we aim to provide a platform for students to share news about the wide range of social and political struggles in which they’re involved. Our goal is to elevate voices of resistance in their many guises, from the high-decibel struggles that command media attention, like this past fall’s occupation of Cooper Union, to pockets of incipient youth organizing that don’t yet have a name, much less a prominent public profile. In the process, we hope to demonstrate the breadth and depth of the US student movement. Please be in touch with questions, tips or proposals by e-mailing studentmovement@thenation.com. In North Carolina, students face the most Republican-dominated government the state has seen in 100 years. With a new governor, backed by millionaire conservative kingmaker Art Pope, everything from cutting the budget for public education to ending the corporate income tax will be on the table. 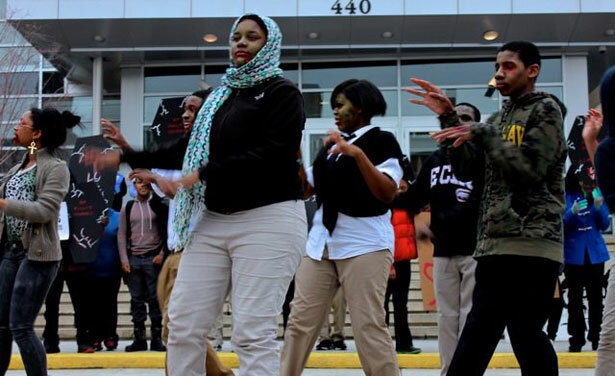 To resist these attacks, the North Carolina Student Power Union is forming a network of young people and convening a statewide conference on February 16, Retaking Our Schools, Remaking Society. One major order of business will be a campaign to secure in-state tuition for undocumented students in the state. In Buffalo, SUNY students successfully pushed back a transparent attempt to churn out corporate propaganda under the guise of peer-reviewed research. After exposing the so-called research center’s real agenda, a coalition of students and faculty forced the University at Buffalo to close the doors on the Shale Resources and Society Institute, a hydrofracking research institute backed by the natural gas industry. This spring, New York Students Rising, a student-led coalition fighting to build student power, will be working with faculty unions and other allies to push through legislation that would make SUNY’s Research Foundations subject to the Freedom of Information Act. Students are also planning a Northeast Student Power Convergence to bring together allies from across the Northeast to strategize larger fights. Students United for Public Education evolved out of the work of college students defending public education from its attackers. SUPE, which aims to become the first national student organization focused on the defense of public education, works from the premise that the profit motive cannot guarantee a good education. Instead, only a robust and well-supported public education system—along with the courage and will to directly confront problems of racial and economic inequality—can provide quality education for all. This spring, the goal is to establish three to five chapters nationally and build campaigns to assist high school students organize in their communities. University and high school students across Colorado and the broader Rocky Mountain region gathered in early January for the Rocky Mountain Student Power Convergence. The four-day conference initiated a number of new projects, including the Colorado Student Power Alliance, which aims to galvanize and connect student and youth organizers across the state. It also gave rise to plans for future mini-convergences aimed at empowering K-12 students to join the fight against the injustices of Colorado’s increasingly corporatized education system. More than 4,600 Harvard clerical and technical workers have been laboring without a contract since the union’s last deal expired on June 30, 2012. Over the past semester, Harvard has proudly touted the remodeling of all its undergraduate residential houses and the expansion of an online education platform called edX. Yet Harvard’s administrators tell its workers that the school’s $30 billion endowment is still suffering from the financial crisis and that it cannot afford a better contract because of “constrained financial circumstances.” Last semester, a stand-out and rally each attracted over 500 workers and their supporters—including dozens of students—who called attention to Harvard’s hypocrisy. This spring, the Student Labor Action Movement will continue to pressure the administration to settle a strong contract with its clerical workers, paving the way to better jobs at Harvard. The labor struggle will be a focal point of the student movements at Berkeley this year. UC Student-Workers Union UAW Local 2865, representing more than 12,000 graduate student instructors throughout the University of California, is facing a contract negotiation with the university in the summer. The union is led by the Academic Workers for a Democratic Union (AWDU), the grassroots activist caucus which ousted the previous bureaucratic union leadership two years ago. Since then, the AWDU-led union has organized with vibrant movement groups, including Occupy Cal, Occupy the Capitol and Students for a Democratic University, to oppose privatization of public education. The union is building a network of stewards in every department on campus so that the administration and the Regents cannot ignore students’ clout. This spring, undocumented youth will continue the fight for immigrant justice in the South. The University System of Georgia Board of Regents continue to ban undocumented youth from the top five universities in the state—Georgia State University, University of Georgia, Georgia College and State University, Georgia Tech and Medical College of Georgia. In response, Freedom University and its supporters are planning actions this spring demanding the Regents overturn the ban. Meanwhile, undocumented people and students are gearing up to fight harsh immigrant legislation and school budget cuts. Over the weekend of March 1, the Ohio Student Association will bring together young leaders from across Ohio to lay out an educational justice platform with a long-term vision for winning structural reforms at the statewide level. Following the March convergence, students will launch a campaign for educational justice centered around the upcoming state budget fight. No other issue in the state is as important for Ohio’s communities as the biennial state budget, and conservative governor John Kasich is promising a new $100 million tax cut, which he thinks will ensure his re-election in 2014. In the last budget, the state cut 13 percent of higher ed funding and $2 billion from schools and local government. It’s high time to reinvest in students and communities. Organizing for a system-wide strike of Indiana University—that is, of the administration and state government which control it—began in earnest at a mass assembly of around 100 students, faculty and staff on December 5. Due to the state’s defunding of the university—IU received only 18 percent of its funding from the legislature this year, and expects to receive only 10 percent by 2020—the cost of college is borne far too much by the students themselves, and many in Indiana who desire an education simply cannot afford it. As of this year, the average debt for an IU graduate is $27,000. At IU-Bloomington, the School of Continuing Studies has been cut significantly, forcing working people to pursue degrees at alternate institutions. Moreover, the Indiana House of Representatives Bill 1402 provides that any undocumented person living in the state is forced to pay out-of-state tuition at the state universities, and Senate Bill 590 legalizes police surveillance of individuals on the basis of appearance. Pledges by past administrations to increase diversity on campus have been ignored. Adjunct faculty and graduate students are relentlessly overworked and underpaid, and undergraduates suffer in mediocre classes as a result. The strike is set for April 11–12, 2013, the days of the spring meeting of the Board of Trustees.